Lock in a great price for Novotel Sydney International Airport (Formerly Mercure) - rated 8.3 by recent guests. Helpful reception staff made for easy check-in and organising of shuttle bus to airport. Very friendly barman and plenty of beers to choose from. Room was spacious with comfortable bed and good choice of pillows. Very handy for the airport. Being located so close to the airport was the main reason for our stay. Bed comfy, service excellent, close to airport but not noisy, park across road for a leisurely stroll. Tuna Salad was amazing!😋 We both thoroughly enjoyed our dinner and breakfast. Bed was comfortable. Great location near airport. Helpful staff. A great overnight stay, restaurant and staff excellent. Just 0.6 miles from Sydney International Airport, Novotel Sydney International Airport features a bar, 24-hour room service and an airport shuttle. All of the renovated and refurbished rooms have views over a golf course or the airport. Guests can enjoy 30 minutes of free WiFi in the lobby. Located next to Cahill Park, Novotel Sydney International Airport is 5 minutes’ walk from Kogarah Golf Course and the Cooks River. Wolli Creek Train Station is a 15-minute walk away. The air-conditioned rooms feature blackout curtains, individual climate control, satellite TV, a tea and coffee maker and a work desk. The bathroom features a hairdryer and guest toiletries. 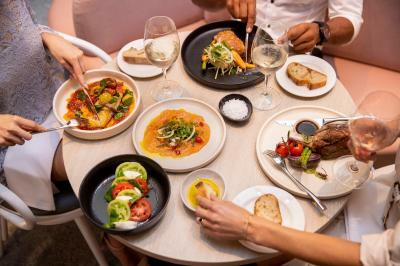 Seasons Restaurant serves modern Australian dishes and an international breakfast buffet. The Bar offers a snack menu and a large screen showing live sports. Novotel Sydney International Airport (Formerly Mercure) has been welcoming Booking.com guests since 2 Oct 2008. 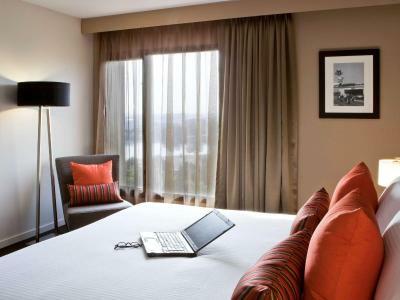 When would you like to stay at Novotel Sydney International Airport (Formerly Mercure)? This stylish room features modern interiors and views of the golf course. Amenities include a work desk and a dining area, a flat-screen TV, an iPod docking station, tea/coffee making facilities and air conditioning. This triple room features a seating area, electric kettle and soundproofing. This quadruple room features a view, soundproofing and seating area. The Mercure Sydney International Airport is ideally located next to the gateway to travel, Sydney Airport. Our property is a leading hotel in the Airport region and offers guests a modern, personalised experienced with an emphasis on ensuring you are given the best opportunity to rest and recover, whether that be before or after your travels. House rules Novotel Sydney International Airport (Formerly Mercure) takes special requests - add in the next step! Novotel Sydney International Airport (Formerly Mercure) accepts these cards and reserves the right to temporarily hold an amount prior to arrival. Please note that parking is available for an additional charge. Please note that WiFi is free when you sign up to become a Le Club member (free sign up). Otherwise, WiFi is charged at an additional AUD 10. Redy2Go Shuttle operates to and from the hotel every 30 - 40 minutes from 04:30 until 23:00 daily, at a cost of AUD 7 per person, per way. International terminal - Shuttle Bus Bay 12. Domestic terminal - Between the Virgin and Qantas terminals, where the road is U shape. Menu selection at the restaurant for dinner was limited. There was no selection for children. For the meal that I ordered, To me it was overpriced for what I was given. The bathroom was a bit tired. Close to Arncliffe And Vincent on front desk is an amazing gentlemen The best! The hotel charges for basic internet access and airport transfers. The location to the international airport was a 10 minute walk. Found finding small plates and cereal bowls a little dificult and I could imagine elderly may find the bending over a little difficult. Staff were very helpful though. Think crockery and cutlery could be put on top of bench. Breakfast was lovely, very roomy and relaxed. Bed was a little hard for my partner. Pillows too soft although I could have ordered a memory foam pillow from Housekeeping.